Last night I had the pleasure of attending Murder at the Conservatory, a game that takes place monthly at the Conservatory of Flowers in San Francisco’s Golden Gate Park. It’s a benefit for the conservatory and as such the tickets are a little pricey. You must be 21 or older and have a valid ID to enter. This post does NOT include spoilers, but if you want to go in completely fresh stop reading here. The story itself will be familiar to anyone who’s read Agatha Christie, Arthur Conan Doyle, countless other murder mystery authors, or even played the game Clue for that matter. One of several characters has committed a murder, and a detective has to figure out who did it. This event differs from other murder mysteries in a number of ways. While you’re free to dress up if you wish you’re only asked to work as a detective, not play as a character in the mystery. All characters in the story are played by actors, giving the production an immersive theater vibe. You’re free to interact with them and ask anything you want as part of your investigation. As is typical for the genre, the setting for the story — at least the current story — is the conservatory itself in the Victorian era. This makes the 1870′s location a perfect fit. Amusingly, the characters were confused by the audience’s modern technology (mobile phones, etc.) One audience member asked a character about DNA evidence only to get a rather silly, confused reaction. All clues are all held by or in the immediate vicinity of the characters, who stay in one place throughout the night and interact with audience members who stop by. I’d estimate the audience consists of up to about 80 people. It’s a little weird at the moment because a nightly light show is projection-mapped onto the conservatory building for the 50th anniversary of the Summer of Love. Though nowhere near as ambitious as the City Hall 100th anniversary celebration it’s a quirky exhibit which can be noticed during the murder mystery. It’s all a mishmash of celebrating both Victorian and late 1960′s time periods in the same place (see photo above.) That said I didn’t find the light show particularly distracting. The trick to solving the mystery is finding out what happened and when, what was the murder weapon, who knows what, and the relations between the characters. Fortunately you’re provided a notebook with the backstory and plenty of space for taking notes. A map is included which shows where to find each character. A light dinner and beer or wine is included in the price of the ticket. The food was mostly vegetarian-friendly when I went, though your mileage may vary. Most of it was not vegan. Drinks can be consumed throughout most of the Conservatory with the exception of the butterfly exhibit. The first drink is free but additional drinks are expensive, though credit cards are accepted. Before you ask… no, I didn’t correctly guess the guilty party. Like any good mystery there were multiple motives and misdirections. There’s no penalty for blaming the wrong character, but only those who figure out the right answer are entered into a drawing for prizes at the end. Getting to the Conservatory of Flowers is relatively straightforward. Follow the Google Maps directions, and from there you’ll find clear signage directing you to the event. That said, I took the N-Judah and while it’s a more or less straightforward path from the UCSF stop through the park, getting back in full darkness and fog proved challenging. Turns out Golden Gate Park is tough to navigate in near darkness. The current season of Murder at the Conservatory runs through January. In February they’ll be back for a new season with a new mystery to solve. Meanwhile, there are still tickets available at upcoming shows. Although the event is two hours long, the first half hour is just for reading the story and grabbing a drink and some food. If you’re running a little late you might not get a seat in the bar room but you won’t miss anything. Pay attention to what the characters say; if they give you insight into another character, take note and be sure to ask the other character for more details. For that matter, remember who is who! Many of the audience members seemed to get the characters mixed up. Perhaps they’d imbibed one drink too many. Bring your own pencil or pen, the provided pencils are cheap crap. Enjoy your surroundings! 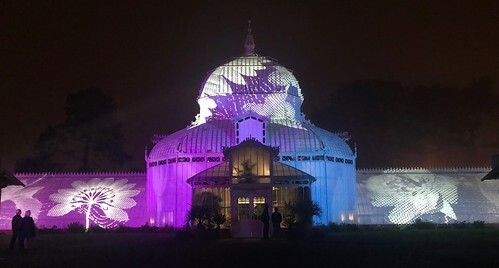 Going inside the conservatory after dark is a truly unique experience. You are currently browsing the MrEricSir.com blog archives for October, 2017.